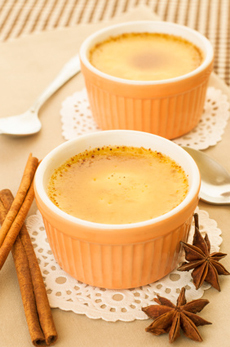 Baked vanilla custard. Photo by Xiebiyun | Fotolia. This page includes terms such as sabayon, tipsy pudding, tiramisu and trifle. See all of our delicious food glossaries. Use this index bar to visit other glossary sections. sets. The meringue is garnished with grated orange liqueur. A savory custard pie that may include other ingredients. Quiche Lorraine has onions and emmentaler cheese. Bacon quiche adds bacon. Potato quiche adds potato. A royale is a plain savory custard with no other added ingredients. Renversée means unmolded in French; hence, a custard made in a mold and unmolded onto a plate. A custard made in a double boiler with cooked rice added. You can add raisins too, and have a combination custard-rice pudding dessert. 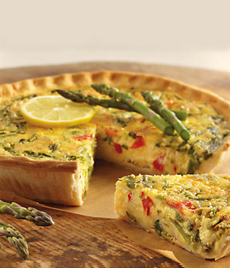 Asparagus and Fontina quiche. Photo courtesy Harry & David. A mixture of egg yolks, flavoring and sugar, beaten over simmering water until thick, then beaten until cool. It is the French version of zabaglione, served over fresh fruit or grilled over fruit (when it is called a gratin). Sabayon is the base for mousses and buttercreams. The bottom layer of this dessert is a rich lemony custard, while the top forms into a delicate light sponge. Unlike basic baked custard, for sponge custards, egg whites are beaten separately and folded into the batter. During baking the batter separates, to form a creamy custard on the bottom with a sponge-cake-like top. A dessert made in a bowl: Rum- or sherry-soaked ladyfingers or other cake lines the bottom, topped with layers of soft custard and whipped cream garnished with macaroon crumbs and chopped nuts. The difference between tipsy pudding and trifle is that the latter has a layer of sliced fruit spread over the ladyfingers, and can be garnished with fruit as well (see photo below). Chocolate sponge custard. Photo courtesy American Egg Board. While there are many variations of the recipe, it is typically composed of layers of sponge or ladyfingers, soaked in espresso liqueur or a similarly flavored syrup, and layered with a mascarpone cheese and custard mixture; then dusted with cocoa or shaved chocolate. The name means “pick me up,” from the espresso flavoring. The recipe was invented in the 1960s at the restaurant, Alle Beccherie in Treviso, Italy by pastry chef Loly Linguanotto; in the local Venetian dialect, the dessert is spelled tiramesu. The origin was tracked down in 2007 by Pietro Mascioni, the husband of a Los Angeles cooking teacher. Matriarch Alba Campeol, mother of owner Carlo Campeol, told Mascioni that she got the idea for the dessert after the birth of one of her children. Tiramisu. Photo by Kelly Cline | IST. Weak in bed, she was brought a zabaglione spiked with coffee, to give her energy. When she returned to work, she and her pastry chef worked on the “pick me up” layered dessert. 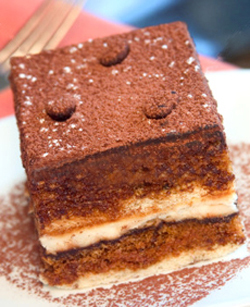 The Becchiere recipe did not contain marsala or any other alcohol because it was served to children as well as adults; today, a good tiramisu is redolent of marsala. You can read the full story, plus competing claims to the invention, in this Washington Post article. 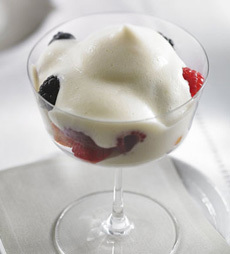 A British dessert made by layering a thick custard, sponge or pound cake, fruit and whipped cream. It is usually arranged with the fruit and sponge cake on the bottom, custard or pastry cream and whipped cream on top. There are many variations of the recipe. Some trifles soak the cake in an alcohol syrup (the dish was originally developed to use stale cake), others sprinkle it with Port, sweet sherry or Madeira. Zuppa inglese is an English trifle especially common in Tuscany, because the English who lived there in the 19th century often asked for it. 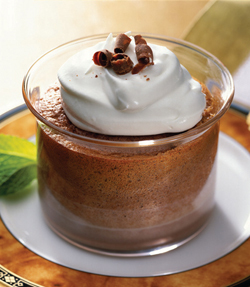 While there are numerous variations of the zuppa inglese recipe as well, it is commonly made with Italian ingredients including ladyfingers, rum, an aromatic liqueur like amaretto or Strega, and cocoa powder. 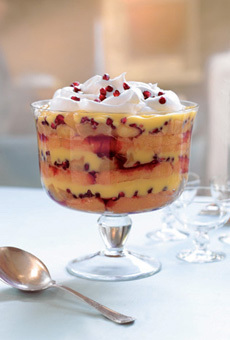 Trifle, also called zuppa inglese (“English soup”). Photo courtesy Pom Wonderful. An egg custard sauce flavored with sweet wine, traditionally marsala, but Port, Tokay and sherry are also used. It is a classic Italian dessert cooked on the stovetop; the custard is most often served warm over fresh strawberries (in this respect, it is very similar to Strawberries Romanoff, except that custard is flavored with Grand Marnier or Cointreau instead of marsala). It can be enjoyed on its own or over a slice of plain cake or ladyfingers. Also try it on coffee ice cream. See also sabayon. 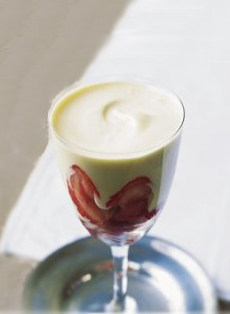 Zabaglione, the Italian sabayon. Photo courtesy Istrianet.org.